It’s fall, and that means pumpkin patches, corn mazes, harvest festivals and of course, scarecrows. But scarecrows wouldn’t have a job if it weren’t for the crows! This cute little guy makes a great magnet for your fridge, or is a fun pin your child can wear to that fall party they were invited to. I used some wood pieces that came in a variety pack kind of like this one . I used the tear drop shapes - one larger one and two medium pieces. The hat is a doll miniature measuring approximately 2-inches in diameter. Paint the two smaller teardrop wood pieces black. Using the pattern as a guide, paint the larger one black at the rounded end and down to the beak. Paint the pointed end dark yellow. Just so you can visualize where the wings should go, place them on top of the pattern. Lift the larger teardrop off and add glue to the round end of the wings. Place the head back on top of the wings. Cut the hat in half and add glue to the rim ends. Let the glue sit for about twenty minutes. Dip the handle end of your paintbrush into the white paint and use it to “draw” two ovals onto the face for the eyes. Use a toothpick dipped in black paint to add the nostrils in the beak. When the white paint has dried, cut the pointy tip off of a toothpick and dip it into black paint. Add the pupils to the whites of the eyes. Once the eyes have dried completely, add some glue to the back and attach the magnet. Hope you enjoyed this project, have fun! If you'd like that Chocolate Chip Cookie recipe that the crow is holding on the fridge, click here! Looking for more? 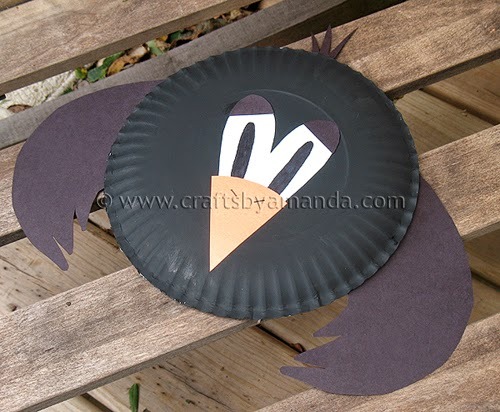 Try my Paper Plate Crow for kids too! That would be cute with the googly eyes too. I'm not much good at painting, but I probably could do this.